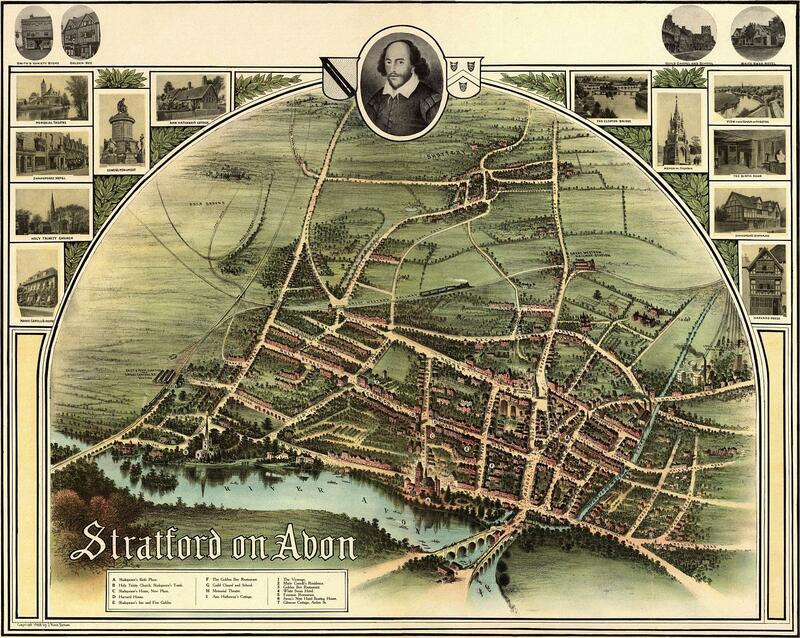 Known as the birthplace of William Shakespeare, Stratford-upon-Avon is one haunted town in a very haunted England. Located on the River Avon, it is a popular tourist town and has many stories of ghosts and unexplained phenomena. The White Lion Inn is haunted by the ghost of John Davies, otherwise known as the Stratford Ripper. According to Haunted Stratford, "Intrepid ghost hunters at the former Whit Lion Inn swear that they have been chased from rooms or even followed home by the man with the knife. On one occasion, a woman insists that he got into bed with her the following night!" One of Davies' victims, a little girl named Alice, also haunts the area as a protective spirit. As many as 40 other distinct ghosts have been attributed to the White Lion. The ghost of a World War II pilot has been seen at the bar at the Dirty Duck pub. The landlady even spoke to the ghost before it excused itself and vanished into the night. Chanting in Latin can be heard coming from the old Boys Grammar School on Chapel Street. When Halls Croft was investigated live on air for the Most Haunted TV show, something threw a wooden spoon at the team. The life-like apparition of a woman, the victim of an unsolved murder, has been seen standing waist-deep in the river. Lucy might be Stratford's most famous ghost. Lucy was a clever 8-year-old little pickpocket who was severely injured in a fire and eventually died of her injuries. Being extremely poor, her mother sold Lucy's body to a doctor. As the doctor was dissecting her, Lucy awoke! Apparently she had only been in a coma. This time she really did die. Her ghost has been accused of resorting to its pickpocket ways, pulling at rings on fingers, snatching earrings and other jewelry. One reporter even felt try to pull coins from his pocket! The sound of heavy footsteps stomping around in some of the rooms. Mysterious figures staring out the windows. The sound of billiard balls colliding in the deserted library. A candlestick floating above a fireplace mantel. The ghost of an elderly woman in Victorian dress in the conservatory. Disembodied women's voices in the empty drawing room. Books fly from shelves in the library. The ghost of a servant named Mary, who died in a fall, has been seen on the main staircase. Your Donations Are Graciously Accepted To Help Me To Keep All About Paranormal Online! All About Paranormal is not intended to be for profit, but does carry an expenses with domain cost, books, decks etc.